I thought I would start a topic here in Development for the upcoming Denariium client. It is still a work in progress and I will try to update this thread as updates come. Currently I have the denariiumx-server syncing with denariusd perfectly, I just need those who wish to setup volunteer Denariium nodes for connection with the Denariium client. If you have a fix or additions, etc. please put a pull request up on the github! 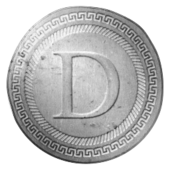 I have yet to test if the Denarius WIF, P2PKH, P2SH, P2WPKH, etc. are correct yet. I recently updated the way denariusd returns the getblock RPC command, this change was needed for the Denariium code to sync blocks properly. I may eventually be adding the estimatefee RPC command as well to add this functionality to Denariium (currently it is running off a fakeestimationfeedaemon). Once everything is setup and running smoothly the website denariium.org will come with more information, along with downloads to the client. Do I just compile and run it in order to run a node? I have had too many issues with DenariiumX-Server lately, so now testing out the older server, which does now have tribus_hash support and seems to be syncing the chain with denariusd just fine so far!